If you’re like most dog owners we meet, you care a LOT about your dog’s happiness and wellbeing. That’s awesome! But do you know for sure if your city dog is living the good life, by her standards? Animal welfare is a scientific field focused on assessing whether captive and companion animals are experiencing a good or poor quality of life, based on measures of the animal’s health, behavior, and emotional state. One common framework used to assess animal welfare is the Five Freedoms. The first four freedoms are pretty straightforward. They don’t mean to suggest that your dog should never feel anxious or afraid, or that they can never get sick or have a grumbly tummy because dinner is served late (your dog may disagree with that last one!). Rather, they simply mean that your dog should not be in a chronic state of fear, distress, discomfort, etc. But what about the fifth freedom, the freedom to express natural behavior? Let’s face it: city dogs have a lot of restrictions placed on their behavior. Too often, Very Important Dog Activities (VIDAs) like sniffing, digging, running, barking, chasing small fluffy critters, being able to move away from scary things, and laying about in the sunshine, are thwarted by short leashes, strange dogs, crowded streets, overly friendly strangers, and long days home alone. What’s a dog owner to do? Before you sublet your apartment, quit your job, and look for an idyllic house in the country for your best furry friend, try these 3 simple suggestions to provide your city dog with ample opportunities to engage in critically important natural dog behaviors. 1. Let them Sniff! If we had to pick ONE activity to maximize welfare for city dogs, it would be the opportunity to explore a naturally landscaped environment at their own pace. How to do it: 3-5 times per week, hit up one of your city’s large parks (or, even better, a nearby hiking trail), and let your dog take you on an adventure*. We like to kick off these walks with a cue, such as “Go Sniff!” so the dog knows this is his time to explore and have fun. Allow your dog to navigate the environment at his own pace (even if he’s a smell-obsessed hound mix who is compelled to spend 10 minutes carefully examining every inch of a seemingly innocuous rock or tree stump). *This is a fantastic activity to do off-leash, IF the area is safe and allows off-leash dogs, and if your dog is social with other dogs and people, and responds reliably to your cues. Otherwise, try using a longer leash for these walks to allow for good freedom of movement. 2. Find out which activity your dog LOVES, and do more of it, in a setting where your dog feels comfortable. 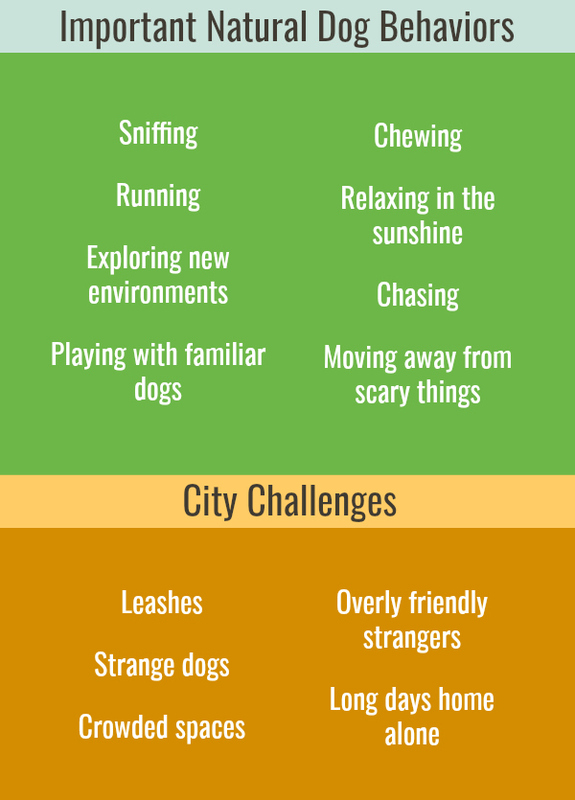 This sounds simple enough, but city dogs are often asked to engage in activities they don’t particularly love, in settings they aren’t particularly thrilled about. A great example is the well-meaning owner who takes their dog to the dog park every day to play fetch; the dog loves fetch but doesn’t particularly like being around other dogs (in fact, she sometimes gets in scuffles at the park when another dog approaches to try to get in on the game of fetch), but the owner doesn’t know where else to go to let the dog off-leash to play. Ball-crazy dog? Play fetch in your apartment, tossing ball or soft toy down your hallway or into another room; or, take your dog to a quiet area of a local park on a long line, at a time when there are no other dogs around. Squirrel-crazy dog? Purchase a Flirt Pole and play with your dog inside, or outside in a quiet area of a local park on a long line, when there are no other dogs around. Sniff-crazy dog? These dogs LOVE activity #1, above, but you can also play scent games inside, or take them to a local park and scatter some treats on the grass for them to find. Dog-lovin’ dog? Dog parks can be difficult environments for a lot of dogs. If you choose to go, do so at times when it’s less busy, and when you can first observe the other dogs and determine whether the group dynamics and play styles are suitable for your dog. Other great options: meet up with a dog-owning friend and take your dogs for a walk together; or, find a well-run daycare and send your dog for a ½ day, 1-2 times per week (not all dogs are suitable for daycare; typically, younger, more social dogs tend to enjoy it most). People-lovin’ dog? Take your dog to the pet store, the hardware store, the bank, or to hang out with you on a bench at a local park. For dogs who truly enjoy meeting and interacting with new people, these are great places to find folks who are eager to say hello to your pup and make them feel extra-special. Forrest Gump dog? If your dog LOVES to run, find a way to let her do it on a regular basis. Take up jogging, find a Dog Runner, or go to the park and practice repetitions of Stay/Come on a long line (this will give your dog a chance to sprint toward you as fast as they can, and you’ll get to practice two important life skills!). Lazy-bones dog? Find a comfy spot in the grass, or on a bench, at your local park, and enjoy some quality lounging time together. Water dog? Most cities have one or more dog beaches; if your dog doesn’t enjoy mingling with lots of strange dogs, you can look for spots like NYC’s Water4Dogs, to give your dog opportunities to splash in private. This is an important one. It’s tempting to think of the freedom to engage in natural behaviors as synonymous with the ability to do things that are fun and enjoyable (case in point, all the activities listed in #2, above). And that’s true, but it also includes the ability to engage in natural avoidance behaviors. For example, your dog may dislike saying hello to other dogs on-leash; the leash can make it very difficult for a dog to successfully engage in natural avoidance behaviors, unless we as owners know what to look for, and how to help. *There are lots of things we can do, through training & behavior modification, to help dogs feel more comfortable in situations that currently make them feel anxious or fearful, but it’s still critically important to listen to their cues and help them avoid/move away from uncomfortable situations as they go through the training process. If you’re interested in learning more about animal welfare science, consider signing up for the awesome free course provided by Coursera.